↑ Eron, Carol (1979). "Women in Medicine and Health Care". In O'Neill, Lois Decker. The Women's Book of World Records and Achievements. Anchor Press. p. 204. ISBN 0-385-12733-2. 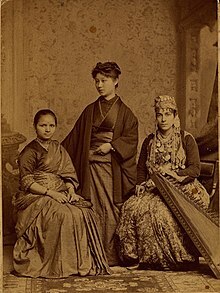 "First Hindu Woman Doctor"
↑ "Historical Photos Depict Women Medical Pioneers", Public Radio International, 2013-07-12. Retrieved on 2013-10-29. ↑ "IRDS Awards 2011". Irdsindia.com. Retrieved 29 October 2013. "आनन्दाबाई कष्टपरम्परायां सत्यां महता परिश्रमेण अमेरिकादेशस्य पेनिल्वेनियाविश्वविद्यालयतः १९ शतके एव आधुनिके वैद्यकीयशिक्षणे स्नातकोत्तरपदवीं प्राप्नोत् ।"
Mrs. Caroline Healey Dall (1888). The Life of Dr. Anandabai Joshee. Roberts Brothers, Boston. http://archive.org/stream/lifeofdrananabai00dalliala#page/n7/mode/2up.